Diagnosis: Dead. Remedy: New Birth. Apart from the new birth, we are dead in trespasses and sin (Ephesians 2:1-2). Apart from the new birth, we are by nature children of wrath (Ephesians 2:3). Apart from the new birth, we love darkness and hate the light (John 3:19-20). Apart from the new birth, out hearts are hard like stone (Ezekiel 36:26; Ephesians 4:18). Apart from the new birth, we are unable to submit to God or please God (Romans 8:7-8). Apart from the new birth, we are unable to accept the gospel (Ephesians 4:18; I Corinthians 2:14). Apart from the new birth, we are unable to come to Christ or embrace him as Lord (John 6:44, 65; I Corinthians 12:3). Apart from the new birth, we are slaves to sin (Romans 6:17). Apart from the new birth, we are slaves of Satan (Ephesians 2:1-2; II Timothy 2:24-26). Apart from the new birth, no good thing dwells in us (Romans 7:18). 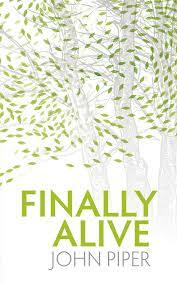 On the first page of Finally Alive Piper states that “the declaration of Jesus that we must be born again (John 3:17) is devastating to the one who would be captain of his soul. Not many biblical realities are better designed to reveal our helplessness in sin” (pp. 9).